My family loves playing board games and video games together. While it makes for some fun times and time spent together, playing these games doesn’t really get any physical activity in. 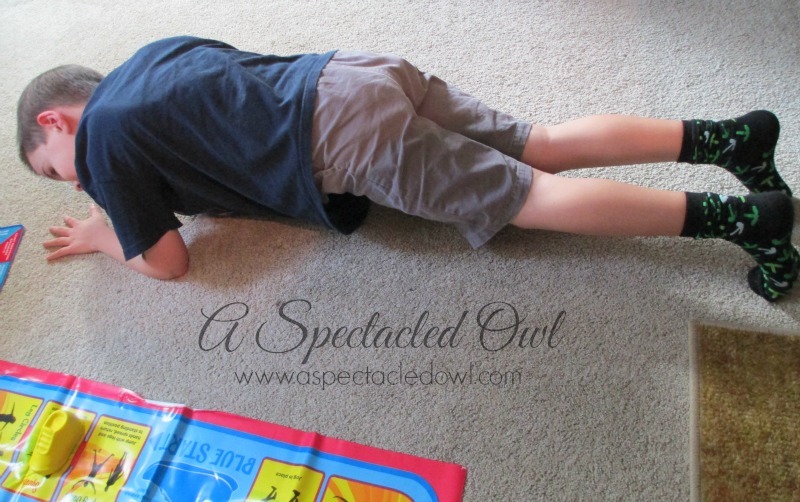 Plus, since we homeschool, I like trying to find ways to add in exercise and still make it fun. We just found out about the board game Fitivities and my kids are in love! Fitivities is a board game but so much more too! It’s a great game to play in groups and to get everyone moving. No matter what age or fitness level you’re at, Fitivities will get you moving and having fun! The premise is simple: One player from each team, rolls their team’s dice and move that many spaces on the large game mat with their adorable shoe game marker. Remembering the exercise that they landed on, they must run back to their team and spin the arrow on their spinner card. Following the directions on the spinner, each team has to complete the exercise repetitions together before the 2nd player can run back to the game board, roll the dice & start the process all over again. Whichever team manages to make their way all the way around the mat, landing on and completing the first exercise past their starting point, wins the game! What’s great is that all teams are playing at the same time, doing the exercises in a big group and having a great time. 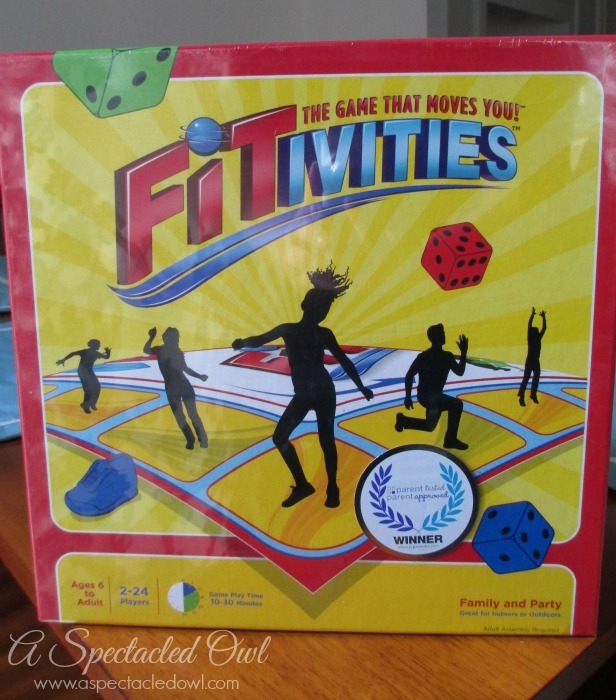 Since Fitivities can be played with 2-24 players (ages 6 to adult), it’s perfect for birthday parties, church youth groups, family BBQs, game nights, camping trips, homeschool groups and so much more! Kids and adults alike have a great time playing and exercising at the same time. It’s also great that there aren’t a bunch of pieces that you have to set up. 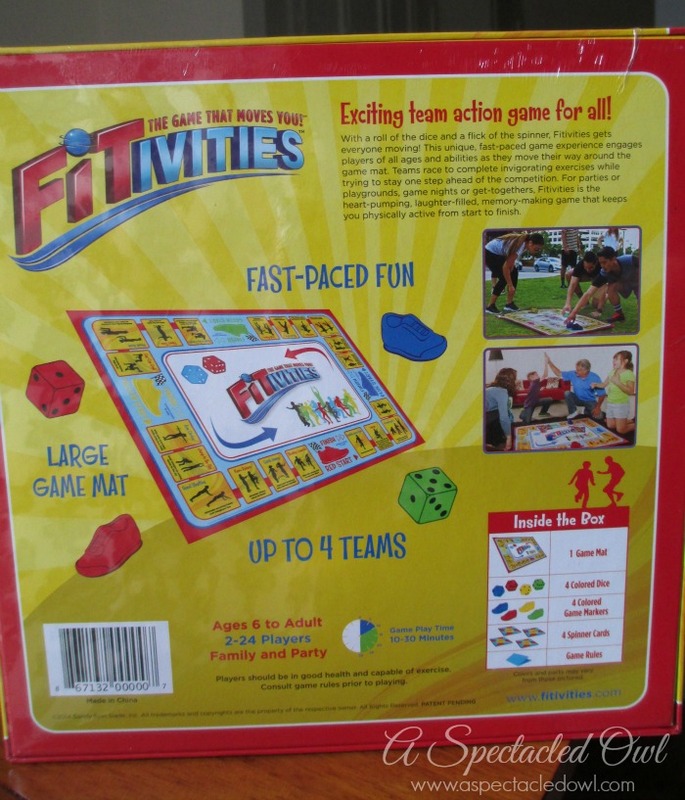 Fitivities is simply a large game mat, 4 large dice, 4 show markers, 4 spinner cards and the rules. That’s all that’s needed! 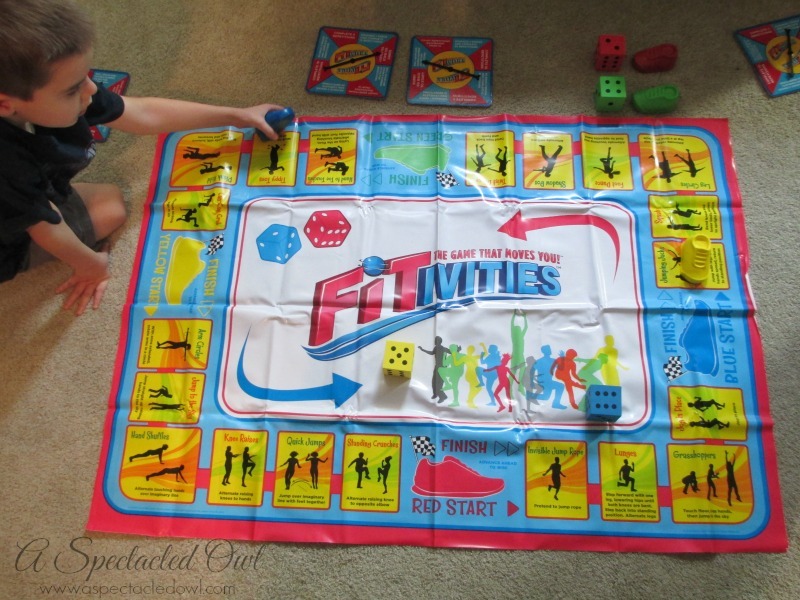 Fitivities was created by Sandy “Spin” Slade, who also created Skillastics®, which are the series of oversize board games that over 10 million students around the country have enjoyed. Sandy’s mission has been putting a spin on physical activity and making it not boring. Sandy has performed her basketball-spinning tricks since she was a teen, leading into her showing off her skills at NBA halftime shows. 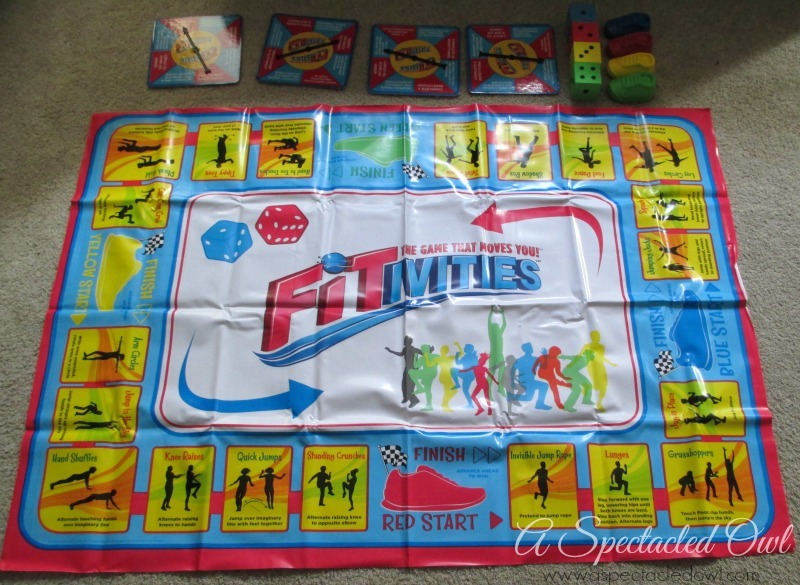 Fitivities is the newest game in bringing Sandy’s dream of bringing physical activity and fun into our homes. Find out more about Fitivities by visiting their website, plus check them out on Facebook & Twitter. You can buy the game on the Fitivities website or on Amazon. Now two lucky people will win their own Fitivities game. Enter below & good luck! 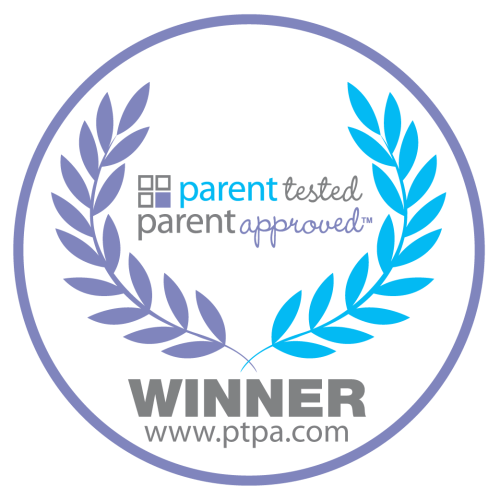 Disclosure: I am part of the PTPA Brand Ambassador Program with Fitivities and I received compensation as part of my affiliation with this group. The opinions on this blog are my own. If I win Fitivities, I would play it with my family. If I win I will play the game with my granddaughter. I would donate this to the church’s youth group. That’s really sweet of you, Shannon! I think I am going to do the same (or at least let them borrow it). I can imagine my daughter & the middle schoolers having a BLAST with it! My grandkids, they would love this cool game!! I would play with my nieces. I would donate it to my little guy’s class. This would be a great game for the family. I will be playing this with my grandkids. If I won I would be playing this with my kids, they would love it. My husband and kids !!! I would love to play the games with my granddaughter. I would be playing with my family and probably try it with a group of kids that I do counseling with to build the team work skills. I have never heard of this company/ game before but sounds like a business with good ideas! id play this with my family ! This looks fun, I would play it with my kids! I would be playing with my grandchildren. I would definitely be playing with my son and my niece. My little ones love to work out with me so they would love this! I will be playing with my granddaughter Kaitlyn. She is watching me enter the sweepstakes and hopes we win so we can play. This would be a fun game to play with my kids! I will be playing with my kids. I will be playing with my husband & daughter. Maybe the neighbor, and maybe my friend. May even take it to work!! I work for a school and I would donate this to the PE teacher if i win. This would be great for my niece.